To date, 6 Degrees has convened influential events in Toronto, The Hague, and Vancouver and has hosted conversations on inclusion in the realms of entrepreneurship, youth employment, and education. Ministers, mayors, and princes have conversed with students, retirees, artists, and academics at our forums. Underway are plans for events in Calgary, St. Gallen, and Berlin, in addition to our annual 6 Degrees Citizen Space in Toronto. He also didn’t have a team, working instead with CEO Charlie Foran and ICC Co-Chairs John Ralston Saul and The Rt. Hon. Adrienne Clarkson to build a brand and a plan for something that would be unique in the world. He would begin by breaking some rules. “I knew it had to be something very fresh and young looking,” explains Alain. “My way of looking at 6 Degrees was that it couldn’t be a boring, academic-looking event – not of the elite.” One manifestation of that vision was inspired by a talk he saw at Davos and is a signature characteristic of 6 Degrees – the 360 in-the-round sessions that break down the space typically dividing “expert” from “audience.” The circle became our place of conversation. 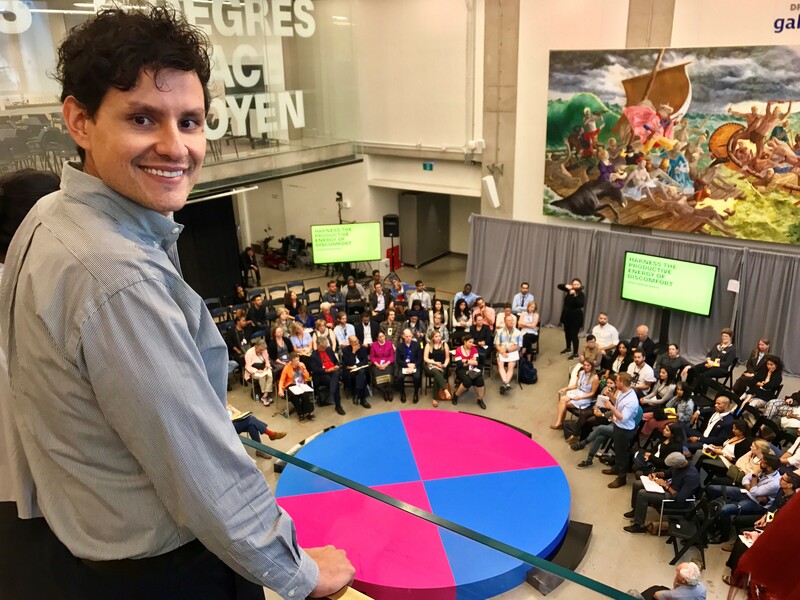 It also became the pink and blue “alarm” mark of 6 Degrees, demanding immediate attention to an issue, and also recognizing the importance of Indigenous practice and symbology to our Canadian perspective. He describes one of 6 Degrees’ early successes – being invited to The Hague, Netherlands by Deputy Mayor Rabin Baldewsingh, an immigrant himself. Suddenly 6 Degrees was reimagined: no longer just an annual Toronto-based event, but one that could travel and share Canadian practices while learning from other models. Being invited to the progressive city known for international diplomacy during a contentious election year in which an anti-immigrant, populist narrative was gaining traction was illustrative of 6 Degrees’ value and practical potential. Baldewsingh has told 6 Degrees that the conversations at 6 Degrees led to policy changes in the Netherlands, and has said that the conversations continued long after amongst attendees, academics and civil society groups in his country. “Through our event I feel like attendees can … reflect on how they think about serious world issues and compare themselves to other progressive countries,” said Alain. In his role of finding people who are creating more inclusive societies, Alain has met a multitude of impressive change-makers. One he remains connected to is Regina Catrambone, a speaker at 6 Degrees Citizen Space 2017. Well before the conversation on the refugee crisis escalated in 2014 with the photograph of young Alan Kurdi lying on a Turkish beach, Catrambone and her husband were successful Italian entrepreneurs who recognized there were serious migration issues on the Mediterranean that were not being addressed. They invested in a fleet of boats and created an NGO that would support and rescue those fleeing the Middle East and North Africa seeking a better life. Today, the Migrant Offshore Aid Station (MOAS) has reached 80,000 people, including Rohingya in Bangladesh. He vows to forever be a part of 6 Degrees and perhaps even to bring it to the global south for the first time. So is 6 Degrees Mexico City next? “I hope so,” he says.